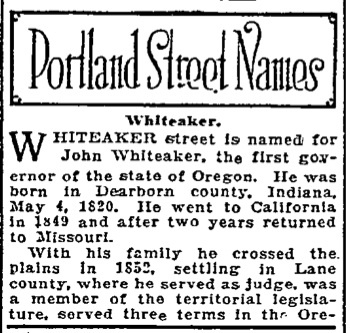 Whiteaker street is named for John Whiteaker, the first governor of the state of Oregon. He was born in Dearborn county, Indiana, May 4, 1820. He went to California in 1849 and after two years returned to Missouri. With his family he crossed the plains in 1852, settling in Lane county, where he served as judge, was a member of the territorial legislature, served three terms in the Oregon house of representatives and one term as state senator. During these terms he was speaker in the house in 1868 and president in the senate in 1876 and again in 1878. He is the only govenor who served in the legislature after having been chief executive. Supposing the new constitution adopted by the people of Oregon had been accepted by congress and the stated admitted to the union, the state election was held in 1858, but the state was not admitted until February 4, 1859. Governor Whiteaker assumed office immediately and was in the gubernatorial chair when Fort Sumpter was fired on and the civil war begun. 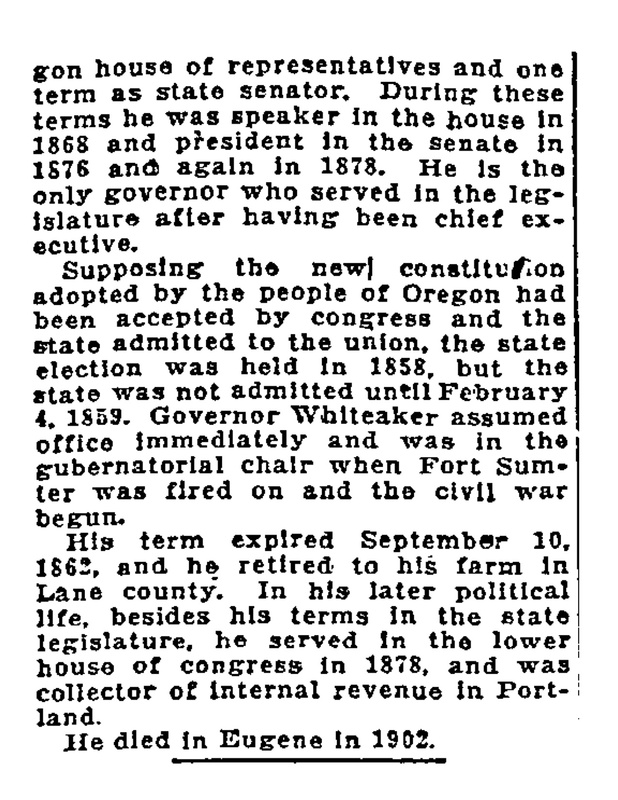 His term expired September 10, 1862, and he retired to his farm in Lane county. In his later political life, besides his terms in the state legislature, he served in the lower house of congress in 1878, and was collector of internal revenue in Portland. He died in Eugene in 1902.